Executive Summary: In the near future, Britain is a neo-fascist state. A shadowy freedom fighter called only V emerges and plots to overthrow the government, with the help of a young woman named Evey. 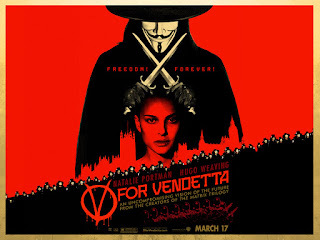 Dystopian Visions: V for Vendetta checks a lot of dystopian boxes- the government is 100% neo-fascist, replete with every -phobia you care to know, state monitoring, control via surveillance as well as deputized 'fingermen', ordinary thugs put in positions of state police. Utopian Undercurrents: The main theme of V for Vendetta is the power which ideas have. V, as a person, in fact assumes the identity of an *idea* not just that of a person. His death becomes immaterial, as others have adopted his ideal and/or have the courage to stand up for it. For as much as Alan Moore has said he hates the film adaptation, the last few scenes (which I would love to spoil here and ramble about, even though you have probably seen it) are incredibly powerful and moving (as is the conclusion of the graphic novel). Level of Hell: Seven. Things are bad, to be sure. Really bad, in point of fact. But if you keep your head down, you can be okay. But that's sort of the point. Legacy: Personally, I hold both the printed and film versions in very high regard. Its legacy seems to have fallen by the wayside, in the shadow of everything else Moore has done and the fact the the Wachowski's haven't made a good movie since... this one. It is, however, quite relevant today and worthy of a re-read and/or watch. In Retrospect: V for Vendetta ages very well, possibly being even better with age. The art is wonderfully bleak, matching the tone and environment, and the writing plays with the themes of the story in deep and inventive ways (V's initial monologue to Evey being the most well-known example, but far from the best). Moore has a fantastic introduction the graphic novel, which, while outside of the story proper, holds true today.